Neil has been involved in the Chinese health arts for over 20 years. He holds Acupuncture, Chinese Herbal Medicine and Tui Na Massage qualifications from prominent British colleges, and a certificate in Traditional Chinese Nutrition from Yao San university in Los Angeles, and has also completed 2 advanced clinical internships in China at the Zhejiang University of Traditional Chinese Medicine in 2004 and in Beijing with renowned herbal specialist Dr Feng Shi Lun in 2016. 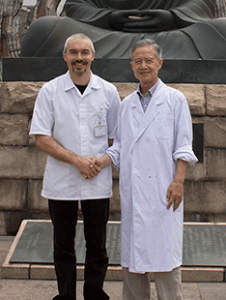 He is a member of the Association Of Traditional Chinese Medicine (ATCM), the British Register Of Complementary Practitioners (BRCP) and is also a founder member of the UK Register of Tui Na Chinese Massage (RTCM). Neil is the best-selling author of “A User’s Guide To Chinese Medicine”, as well as writing for various journals and magazines. He specialises in teaching the concepts and techniques of Chinese Medicine to lay audiences. He teaches both acupuncture and Chinese nutritional therapy, and regularly gives talks and runs workshops and courses on all aspects of Chinese Medicine. Neil has experience treating a wide range of conditions and complaints of all kinds, and has worked in diverse settings, helping people from all backgrounds – including young sports-people, children with learning difficulties, corporate groups, and various health organizations as well as the full spectrum of different kinds of people in his clinics and courses. In his clinics, Neil achieves good results with a wide range of different conditions by using a holistic, integrated approach to treatment, even in cases where acupuncture or similar therapies have failed in the past. He will work with you to monitor your progress throughout the treatment, in order to get the best possible outcome.